Department, Group, and Project Administrators, collectively called Team Admins. There are differences between the three types of teams that will be outlined. The tools available are the three dots “admin tools”, team tools drop-down, and more options in some of the modules. Domain Admins have access to the following logs in the MangoApps Admin Portal UI from under the “Security” module. Google Apps authentication (OAuth 2.0) allows users to sign in to MangoApps using their Google Apps accounts. This feature can be enabled by Network Administrators. How to use Custom OAuth App for Google see this article. To enable the Google Apps authentication, navigate to Admin Portal and then select “Integration” in the left navigation. Protected: How Do I Enable Google Apps for Sso in Mangoapps? How Do I Change the Locale Settings for My Domain? Go to the Admin Portal. Choose “Domain” -> “Locale Settings”. After you’ve finished making settings changes, choose one of the radio buttons to apply the changes to everyone in the domain or just the new users then click the “Save Settings” button. How Does Auto-follow Work in Mangoapps? What is the number of users that will work with the auto-follow feature? How do I disable auto-follow? Can I override the auto-follow setting? What Are the Different Levels of Access for People in My Company, Contractors, and Clients? Many companies today consist of multiple subsidiary companies. The subsidiary companies might represent distinct business units, brands, or geographies. For example, Google owns subsidiary websites like google.com, adwords.com, youtube.com, google.co.uk, and google.de, among many others. Similarly, a state university might have multiple .edu internet domains for each campus. Why Should I Define Admin Roles in My Domain? Admin Roles granularly define the capabilities that Admins have to affect domain-wide functionality. Below is a table showing all of the roles that the different admins have access to. 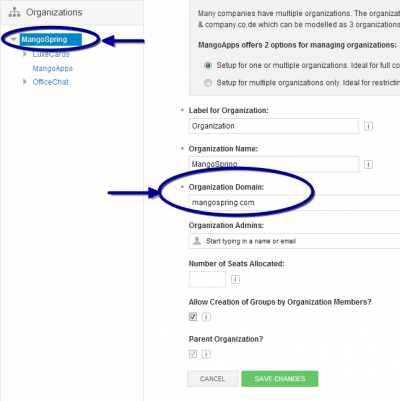 Domain admins can turn off or on different functionality across the MangoApps domain. What Do I Need to Know About Organizations in Mangoapps? Where do I configure Organizations? What is the “Default Organization”? How Can Mangoapps Admins Use the Super Password for the Domain? How can I set or reset the domain super password? How Can Administrators Allow or Restrict Out-of-network Members to Mangoapps Network? Administrators can control whether to allow or disallow Out-of-Network members to MangoApps.